Throughout history, the land of Jordan has been renowned for its luxurious vegetation and wildlife. Ancient mosaics and stone engravings in Jawa and Wadi Qatif show pictures of oryx, Capra ibex and oxen. Known in the Bible as the land of milk and honey, the area was described by more recent historians and travelers as green and rich in wildlife. During the 20th century, however, the health of Jordans natural habitat has declined significantly. Problems such as desertification, drought and overhunting have damaged the natural landscape and will take many years to rectify. Fortunately, Jordanians have taken great strides in recent years toward stopping and reversing the decline of their beautiful natural heritage. Even now, the Kingdom retains a rich diversity of animal and plant life that varies between the Jordan Valley, the Mountain Heights Plateau and the Badia Desert region. Arabian Oryx at the Shomari Reserve. Spring is the high season for Jordanian flora, and from February to May many regions are carpeted with a dazzling array of flowering plants. More than 2000 species of plants grow in Jordan, and the variety of the countrys topography and climate is reflected in the diversity of its flora. Most of these species, however, depend heavily on the winter rains. When there is a warm, dry winteras in 1984many flowers either fail to appear or are considerably reduced. Jordan's national flower, the Black Iris. 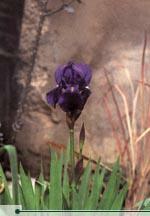 Jordan boasts a wide variety of flowering wild flowers, but the most famous is the national flower -the black iris. Fields of this flower, which is not found in Europe, can be seen in masses near the town of Madaba. The highlands of Jordan host forests of oak and pine, as well as pistachio and cinnabar trees. Olive, eucalyptus and cedar trees thrive throughout the highlands and the Jordan Valley. Jordans dry climate is especially conducive to shrub trees, which require less water. 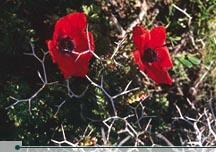 Species of shrubs can be found throughout all the geographical regions of Jordan. Flowers. © Zohrab Contrary to popular conceptions, deserts are often teaming with life. Many small shrub plants thrive in the Badia, where they are often grazed by the goats of local Bedouin tribes. Several species of acacia trees can be found in the deserts, as well as a variety of sturdy wild flowers and grasses which grow among the rocks in this demanding habitat. One can find about 70 species and subspecies of mammals, along with 73 reptile species, in Jordan. The dry climate has limited amphibian species to only four families. About 20 species of freshwater fish are found in Jordans rivers and streams, while around 1000 species of fish are known to exist in the rich waters of the Gulf of Aqaba. 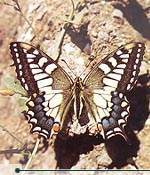 Swallow- tail butterfly The harsh conditions of the desert wilderness, which covers most of the country, allow only an assortment of natures hardiest and most adaptable creatures to survive. As with most desert habitats, the majority of faunal life consists of insects, lizards, and small mammals. However, a number of larger mammals can be found in the desert region, including the Asiatic jackal, desert fox, striped hyena, wolf, camel, rabbit and sand rat. 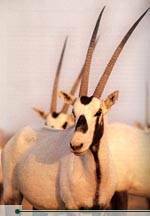 The white oryx, which was hunted almost to extinction, lives on the open plains, while the mountain ibex is at home among rocky, mountainous crags. Both of these two species are relatively rare. Jordan also possesses a large and varied assortment of birdlife. This can be traced, once again, to the variety of habitats found within the countryfrom mountains forests to desert oases, from high cliffs to sweeping deserts, and from deep gorges to broad wadis. Two distinct types of avifauna can be found in Jordan: those species which stay year-round, and migratory visitors. At the junction of the Mediterranean and Arabian faunal regions, Jordan lies on one of the worlds major bird migration routes, between Africa and Eurasia. Before the water levels of the Azraq Reserve were depleted over the past ten years, up to 200,000 birdsincluding spoonbills, white pelicans, egrets, terns and gulls, to name a fewwould congregate there at one time during the migratory season. The numbers of migrants have decreased as Azraq has grown drier, yet even today up to 220 migratory species continue to transit through Jordan on their journey north or south. The approximately 150 species which are indigenous to Jordan seem not to have been affected greatly by the great drought of the 1980s. 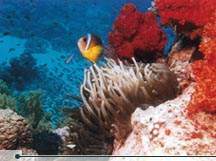 The Gulf of Aqaba is home to some of the finest marine life in the Middle East, while its coral reefs are unmatched in the world. The gulf is very narrowat its northern end it is only five kilometers wideand quite deep, ranging in depth from between 1000 to 1800 meters. The depth of the gulf, combined with its isolation from sea currents, minimize turbulence and improve visibility. On the sandy shores, one can find creatures such as the ghost crab, sandhoppers and the mole crab. The sea waters, meanwhile, host a plethora of marine life including starfish, sea cucumbers, crabs, shrimps, sea urchins, many species of fish and several worms which burrow into the sandy sea bottom. A variety of sea grasses can be found in the shallow waters, providing both food and shelter to the fishes which inhabit the area. Several species of eel make their home in the gulfs grass beds, where one can also find sea horses and pipe fishes. Perhaps the greatest attraction for divers in the Gulf of Aqaba is the colorful coral reefs, found especially near the southern part of Jordans coastline. There are around 100 varieties of stony coral, and they are found mainly in shallow waters, as the algae that live within them require light for photosynthesis. Many hundreds of fish species make their homes among the reefs, and some live by eating the algae that grows on the coral.